May I share with you a special invitation? 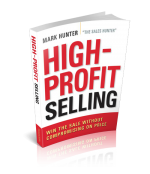 Please Join me Thursday, Dec. 10, @ 11 AM PST, for a Salesforce webinar High-Profit Selling: How Leaders Impact Their Teams’ Success. 1. Do I personally have a relationship with a senior level person at each of our largest accounts? 2. What % of sales are being made without a discount being offered? 3. How many sales calls do I make with each salesperson monthly? 4. Are our customers inviting asking us to be part of their strategic planning process? 5. What % of my time is spent developing my salespeople? 6. Have I uncovered through my customer relationships at the senior level strategic opportunities we can capitalize on? 7. What is the idea I’ve brought to my team from another company outside of my industry? 8. Am I spending less time this year than last year reviewing data and managing reports? 9. What are the 3 things I have championed and have been able to change in my organization to allow my people to be more productive? 10. Do I get more requests from people in my company asking me for my opinion than I get requests for specific information? During this event I’ll be sharing many insights management needs to be doing to help grow top-line sales and increase bottom-line profit. Insights I will share will include those you can put into play immediately and others that will guide you in making 2016 as successful as it can be.